I know. You're probably wondering who the hell Juliana Skiffle is and what she has to do with cookies. Well, it's kinda simple, but you'll have to bear with me. 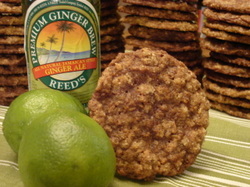 This ginger and lime cookie is inspired by the ginger ale and lime drink that Juliana Skiff, a recurring character in the final season of The Sopranos, orders at The Bada Bing in the episode "Johnny Cakes." I had never heard of that combo before and couldn't wait to try it. It's still my "cocktail" of choice. I got the "Skiffle" part from Tony Soprano's malapropism of Juliana's name when he introduces her to Carmella at Christopher's wake in the episode "Kennedy and Heidi." A little too much detail? Yes, I am a geek. Full disclosure though: Jon and I watch an episode or two of The Sopranos every night before falling asleep. If the power ever goes out, we'll entertain each other for hours doing Sopranos finger-puppet theater. These cookies are so good. They're loaded with flavor and have the perfect crispy/chewy texture. As usual, I use multiple forms of an ingredient to pump up the flavor: powdered ginger, crystallized ginger, ginger beer, and ground-up ginger snaps. And then there's the lime: zest, juice, and extract. A touch of cinnamon, nutmeg, and honey round out the mix. A roll in turbinado sugar gives the cookies a nice shine and a crispy finish. Refrigerate the dough for 30 minutes (to allow the flavors to mingle). Roll each dough ball evenly in turbinado sugar.